No matter your role in the healthcare continuum, patient privacy considerations can impact the quality and delivery of care. And while patients typically have a big say in what information of theirs can be shared and how a critical privacy and security rule has been in place for more than two decades to protect patients' identity and personal information. Since 1996, the Health Insurance Portability and Accountability Act has helped ensure industry-wide standards for the handling and release of sensitive patient records and billing information are handled properly and confidentially. Today, with the transition from paper to electronic records, healthcare professionals must consider how to keep their patients' information secure through technology. Here are a few ways healthcare data security rules can affect your practice. This has all been possible through the advent of electronic health records, which contain information that providers collect in-person and through digital means from their patients. By and large, EHRs have all but replaced manual entry through traditional paper records. But despite providing a greater means of efficiency and transparency for providers and patients, respectively, the collection of patient information through a digital means remains the same as the old-school paper route. Indeed, this collected digital information may include a patient's medical history, list of medications and allergies, notes from previous visits, diagnoses and billing information, all of which can be shared among various providers to provide a more standard level of care, no matter their location. Ultimately, this is why ensuring your practice has a secure and dependable EHR is so important. However, EHRs come with a different set of security challenges than paper records. Of course, it's not all peaches and cream. One of the major concerns with EHRs over paper records is the stronger likelihood of incurring a data breach. Revised in 2013, among the new HIPAA rules was a revised definition of what constitutes a data breach. 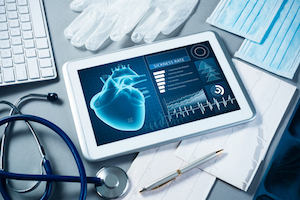 These events are presumed to have occurred when there has been an unauthorized exposure of electronic personal health information unless the provider "can demonstrate that there is a low probability that patient data was compromised." With data breaches affecting major corporations like Equifax, Home Depot, and Target, both consumers and businesses may be apprehensive about transferring and storing proprietary information in the cloud. Then again, your paper records can also become compromised. Indeed, these records can just as easily be stolen, lost or improperly disposed of — just like digital records. And while the threat of a data breach should be a reasonable concern, there are protections in place to protect patient information. No organization is immune to a security threat or breach, but safeguards can be put in place to decrease the likelihood of these events happening. Implementing encryption protections is a major safeguard for providers to protect ePHI. Today, more and more healthcare organizations are taking the necessary steps to secure patient data stored in their EHRs. For example, many providers use secure platforms to ensure patient information transferred between other healthcare professionals — and which can be accessed directly by patients themselves — can't be jeopardized, hacked or stolen. When providers back up their records and other HIPAA-compliant information, they need to use software that encrypts data to ensure its safety and security. One area that can be confusing when it comes to adhering to data security rules is public health. While individual privacy and dignity must always be ensured, PHI can be released en masse in specific instances to identify, monitor and respond to disease, death, and disability if it impacts public safety, according to the Centers for Disease Control and Prevention. Some of these areas with an impact on public health include surveillance, terrorism, program evaluation, outbreak investigations, and research. Knowing this, providers need to make sure they understand HIPAA rules and regulations related to public health and what information can and cannot be used or disseminated. Thanks to new advancements in innovation and more efficient operations, the marriage between technology and health care continues to grow and strengthen every day. But despite the ease in which patient data can now be dictated and stored through technology — and subsequently delivered across the healthcare continuum — providers must ensure their digital platforms remain protected so patient information doesn't become compromised.